Here’s another band I had no idea existed and by the looks of it, it’s gonna take a whole lot of googling to find out anything worthwhile about them as the press release didn’t reveal all that much. One of things that got me interested in reviewing this album is that Dygitals are French. I honestly don’t know of that many heavy metal bands from France. I know about Trust, never dug them, but I do know that Iron Maiden drummer Nicko McBrain once had a stint with them. 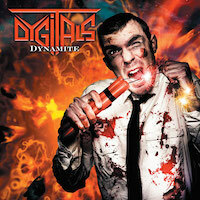 I also found out that Dygitals were formed back in 1984 by a dude named Hervé Traisnel, who is the lead singer. However, not much has been released by this band since they started. According to Encyclopedia Metallium, they have only released four demos and once split CD, French Connection (1985) with three other bands, Steel Angel, Yuggs and Vytal, up until 2003 when they released their debut album called 2003. They released the follow-up Imagine two years later. However, it looks like the band was only active between 1984 – 1990 leaving the band on hiatus for 13 years until they reunited in 2003. But the reunions in 2003 and 2005 were only sporadic and it would take them a few years more, up to 2009 to be exact, until they reunited for real. After that, it would take them three more years until they could release the follow-up Avé in 2012. Since then, the band has been intact and now it’s time for them to release their brand new album, Dynamite. Having starting out as hard rock band, influenced by such bands as Iron Maiden and Accept, they changed direction, like so many other bands, in the later half of the 80’s, taking a more melodic approach, taking influence by American bands such as Bon Jovi, Mötley Crüe and Ratt. Even though they went over to L.A. to play clubs such as Gazzari’s and Whiskey A Go-Go, the break never came and the main reason for the long hiatus is spelled grunge. Today all the melodic rock influences has been replaced with the music that they started out playing: heavy metal. Being the first time I have ever heard of this band, I have absolutely nothing to compare them to and I have no expectations what so ever, so my mind is completely open when I push play and give this record a spin for the first time. The title track is the album’s opener and it sounds like a band from the NWOBHM (New Wave Of British Heavy Metal) era back in the early 80’s, but I also hear both Sweet and Deep Purple in the riffs and the melodies. A good song that makes me want to hear more. “30 Years Of Rock” is one big tribute to hard rock in general and the song name drops more or less every well-known hard rock / metal band known to man. Pretty good song, but the lyrics are a bit silly, to be honest. “No Speed Limit” is a decent hard rocker, no more no less, “Sin City” has a great groove and I love the riffs, but the lyrics are too cliché and the arrangements needs some work, but it’s definitely a good song. “Everybody Knows”, however, is plain horrible. It’s a failed attempt to write a power ballad, but the song isn’t good enough and the vocals sound sour. Sorry, but this one goes into the trash bin. “Will You Help Me” brings the band back on track again – a good and catchy little pop metal number and “No Way Out” is an OK standard hard rock song that reminds me of Krokus. “We Wanna Live Free” falls flat, though, as it is more or less Poison’s “Fallen Angel” rewritten. The song is catchy, of course, but it’s too much of a theft. “Don’t Want To Let You Down” has a good melody and a good message, but the song fails anyway. It sounds as if it is unfinished, like a demo that need more work done on it. But it seems like the guys in Dygitals has saved the best for last as the closing track, “End Of The Story”, is the best song on this album. The riffs and melodies are killer and very catchy in both verses and chorus, a memorable tune for sure. To sum this album up, in my opinion, what this album need a big time producer and a lot more work because to be frank, it sounds like a demo. Also, I’m not that comfortable with the vocals as they many times sound sour and Hervé has some problems with hitting all the notes, but that’s nothing an experienced producer and arranger can’t fix. Also, the mixing is somewhat blurry and muddy and it needs more punch and attack. When it comes to the lyrics, they are very… well, un-english, so to speak. I know that speaking English (or any other language except their own, for that matter) don’t come easy or natural for the common Frenchman, so I will not be too harsh on the guys for that, but sometimes I find it hard to just let the lyrics pass – when they get too much. But there are some good songs here and there is potential in the song writing department – as musicians the guys are faultless – but they need guidance. I will give them an A for effort and I hope that they keep going and next time maybe hire a great producer and mixing engineer. Close, but no cigar this time. No video was found for this album except for this live thingy. I guess it’ll have to do, then.